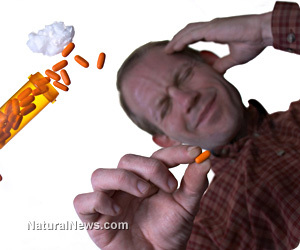 (NaturalNews) Despite its massive $5 billion annual budget, the U.S. Food and Drug Administration (FDA) is failing miserably at keeping tabs on the full extent of harmful side effects caused by FDA-approved pharmaceutical drugs, according to a new study. A cohort of researchers from Microsoft, Stanford University, and Columbia University found that many prescription drug users are experiencing harmful side effects that the FDA often overlooks, particularly in cases where two or more drugs are involved. Utilizing search query data collected through popular search engine portals, the team of researchers led by Dr. Russ B. Altman found that many people who take numerous pharmaceutical drugs for multiple conditions experience a higher-than-normal rate of harmful side effects. Taking the antidepressant drug paroxetine (Paxil) in conjunction with the cholesterol-lowering statin drug pravastatin (Pravachol), for instance, was found to raise blood sugar levels. But because the FDA primarily relies on its vastly-inadequate Adverse Event Reporting System (FAERS) for drug side effect data -- FAERS data predominantly covers side effects caused by single drugs in isolation -- the agency misses all sorts of complications caused by multiple drugs. Beyond this, FAERS only represents a very small percentage of the actual number of adverse events caused by drugs, as it relies on physicians to voluntarily report them. However, the new study, which was published in the Journal of the American Medical Informatics Association, took a closer look at the real number of drug side effects by evaluating specific internet search criteria related to their use. Drug users searching for both pravastatin and paroxetine, for instance, were found to be twice as likely as those searching for just one of the drugs individually to also be searching for the word hyperglycemia, also known as high blood sugar. Similar search habits were observed for other drugs as well. Users taking other types of drugs for multiple health conditions were also found to be more likely than users taking just one drug to search for harmful side effects at an increased rate. What this illustrates, of course, is that pharmaceutical drugs interact with one another to cause even more harmful side effects than they otherwise do when taken in isolation. "I think there are tons of drug-drug interactions -- that's the bad news," Dr. Altman is quoted as saying by The New York Times (NYT). Dr. Altman and his team are hoping the FDA will adopt similar advanced methods of tracking drug side effects. One of the primary purposes of the agency, after all, and the reason it even exists in the first place is to keep track of the drugs it has approved in order to protect public health. And the agency is currently failing at this task, all while it spends untold scarce resources persecuting raw milk farmers and others growing and distributing safe food products. "[The FDA does] have mechanisms and ways to pick up the things that we find and triage them based on anticipated public health impacts," adds Dr. Altman, as quoted by the NYT.